That’s right! 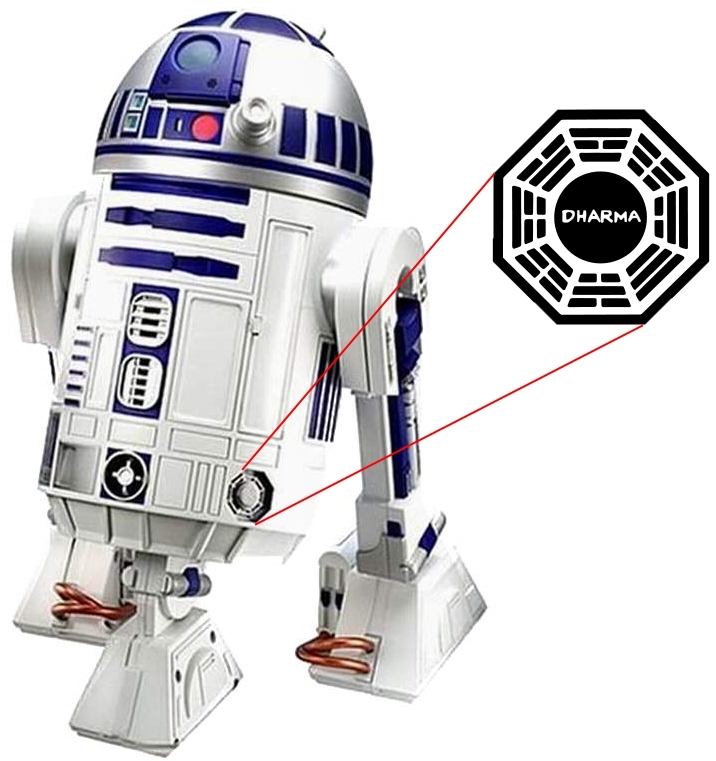 Look who seems to be part of Lost’s Dharma Initiative. “Just like her daddy,” she responded, with her usual smile. David was watching an online episode of “Bleach” anime at the computer. “So, watching some Shōjo manga?” I asked, sneakily. 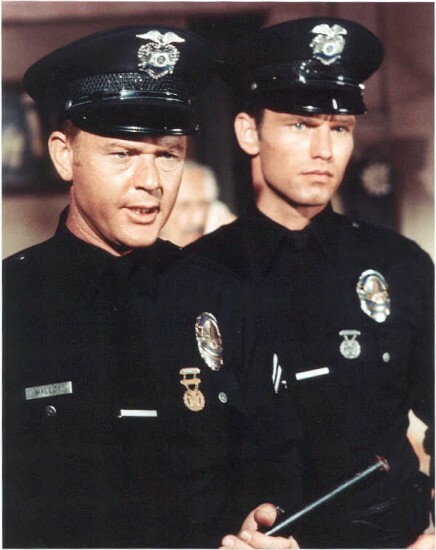 Officers Pete Malloy (Martin Milner) and Jim Reed (Kent McCord) from the Adam-12 television series. In 1978, I was in Mrs. Lovell’s third grade class at Parkview Elementary School, in Easton, Massachusetts. One day we were reviewing vocabulary with a small reading group after a multiple-choice exercise. The vocabulary word in discussion was heroine, and, among the possible definitions was a medicine. When the correct answer was given by another student, I suggested, a medicine, getting me quite a troubled look from Mrs. Lovell, who then asked, “Do any of you know what he is referring to?” “Drugs,” answered Dennis, with an implication of disgust. I’d never heard the female version of hero, but Adam-12 had provided me with an excellent education in the dangers of illegal drug use. In my eight-year-old mind, heroin was a drug, and one obtained medicines at the drugstore, so a drug such as heroin perhaps could be classified as a medicine. Adam-12 photograph courtesy of http://www.kentmccord.com. The boys and I have been hooked. (Isaac, the weasel, has remained several levels ahead of me, and is about to get a promotion that will give him access to even better ships.) 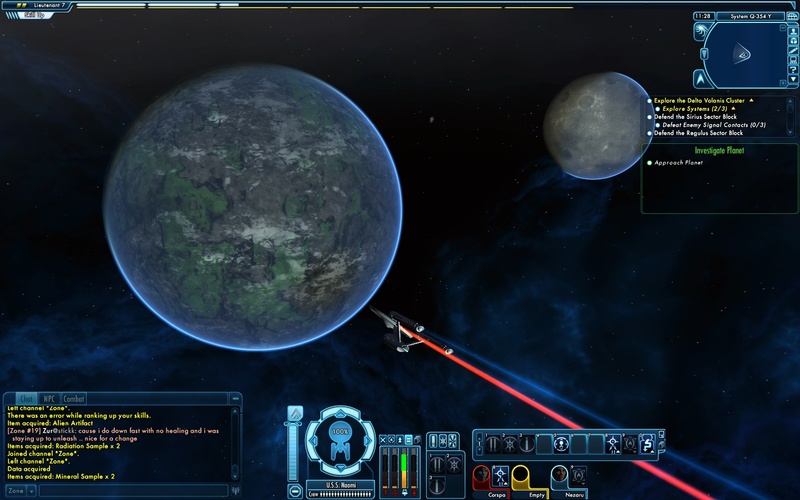 The game features space exploration and combat, and ground exploration and combat. The missions are described as “episodes,” and, like the plots of a television series, often require following unexpected developments and changing tasks as the plot unfolds across planetary surfaces and space. 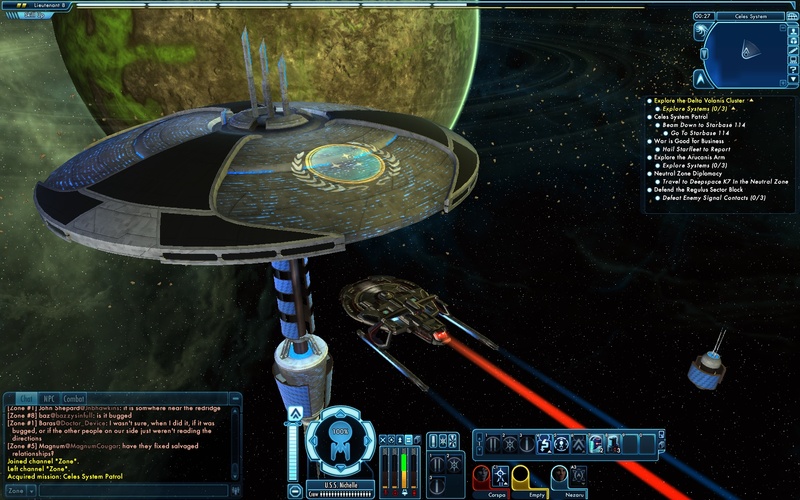 Each player captains his or her own starship, outfitting it with weapons, equipment that gives bonuses, and senior officers who also provide special abilities. I’ve attached a couple of screen shots of the gorgeously-rendered space exploration scenes below. The planets are beautiful, often including moving cloud layers that partly cover the ground below, as well as appropriate atmospheric illumination by the planet’s star, depending on one’s location in orbit. The USS Naomi, approaching a planet within the Delta Volaris sector. 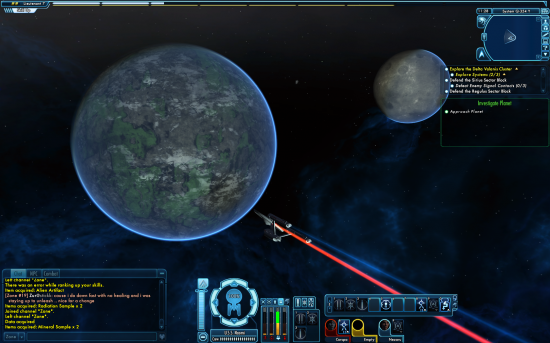 The USS Naomi, exploring a system in the Delta Volaris sector. Ground locations are often also highly detailed, with a wide variety of plants and terrain. Some of the outdoor ground locations (there are also caves, and starbase and other complex interiors) sometimes seem very reminiscent of the ToS set locations, although generally with more detail than the show’s budget allowed. Combat and exploration are both integral to the game. 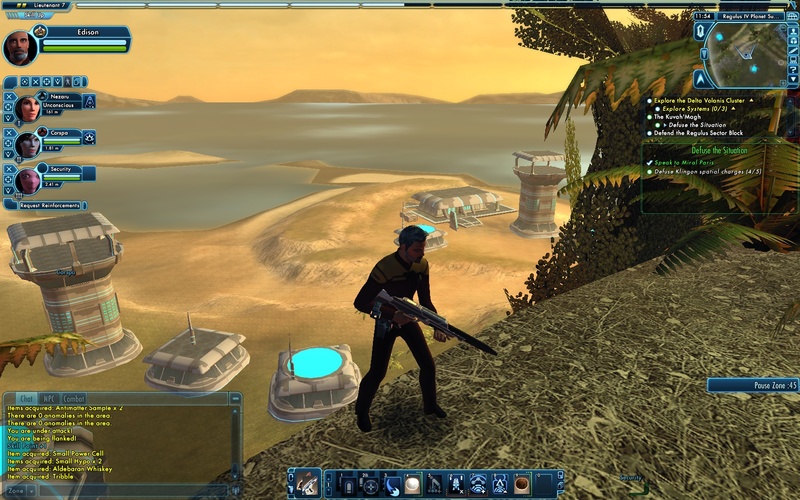 Combat is far more skill-intensive than most MMORPGs, particularly as one commands an “away team” to whom orders must be given, and as space combat works in three dimensions and often against multiple enemies. 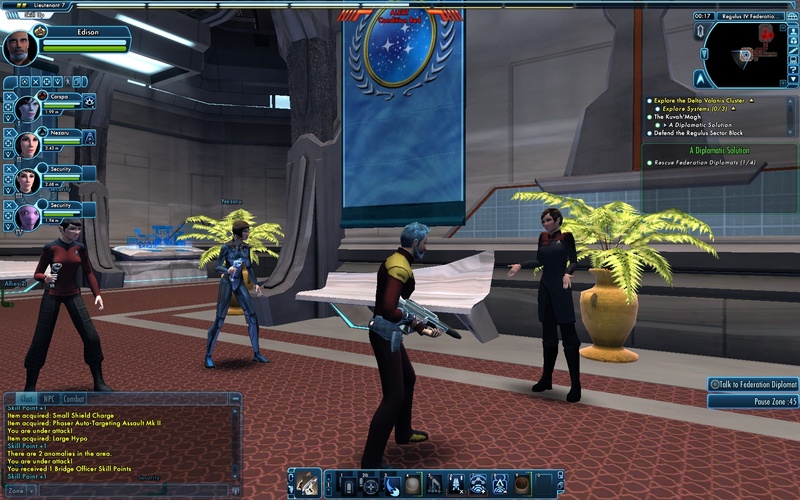 Some missions automatically draft the cooperation of other players, and nearly everything can be accomplished by choice as a teamwork exercise. Like the best MMOs available, there are also large PVP combat areas where players can earn even more rewards. The game is still in early release, and is apparently only going to get better, but it still shows some weaknesses of an early release with higher-than-expected levels of demand on its servers, and some frustratingly common bugs, such as the game locking up. 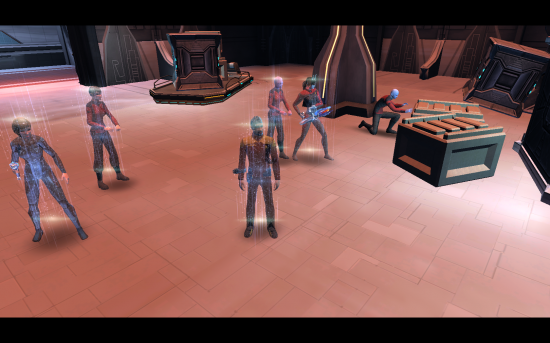 Overall, though, our romps through the Star Trek universe have been delightful, with much future enjoyment anticipated. 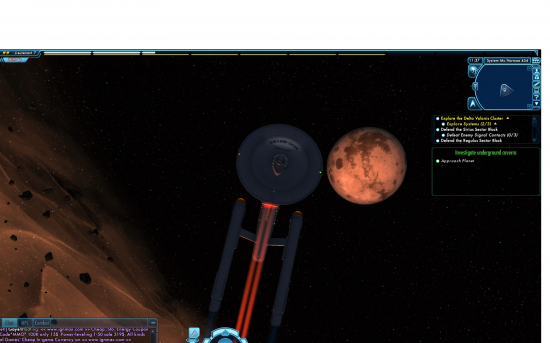 Addendum, Stardate 201002.18: I am fully convinced that this game was worth every penny. Even my beloved World of WarCraft has never captured me with this intensity. Beaming out after an away mission. Rescuing diplomats taken hostage; the end of a truly well-crafted mission series. Beautiful environments abound: This is Regulus. 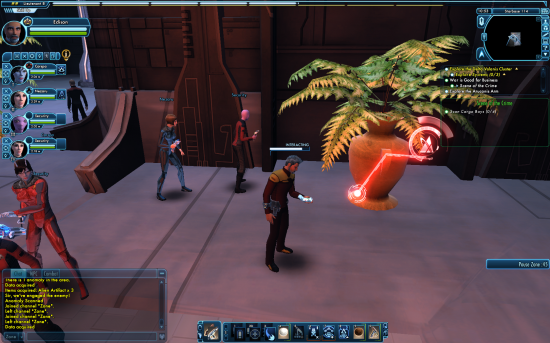 Scanning with my tricorder. What could be better? Starting with the Second World War a whole series of things happened–rising GDP per capita, rising educational attainment, rising life expectancy and, critically, a rising number of people who were working five-day work weeks. For the first time, society forced onto an enormous number of its citizens the requirement to manage something they had never had to manage before–free time. How much television do we watch? [H]ow big is that surplus? So if you take Wikipedia as a kind of unit, all of Wikipedia, the whole project–every page, every edit, every talk page, every line of code, in every language that Wikipedia exists in–that represents something like the cumulation of 100 million hours of human thought. I worked this out with Martin Wattenberg at IBM; it’s a back-of-the-envelope calculation, but it’s the right order of magnitude, about 100 million hours of thought. This reminds me, I was listening to “This American Life,” episode 328, “What I Learned from Television.” In a live broadcast, Ira Glass announces to the audience that average Americans watch 29 hours of television a week. There is a loud, collective gasp from the audience, which is composed of course, of not merely NPR listeners, but NPR listeners who paid to go out and see a live presentation of the radio program. Twenty-nine hours is the average? Suddenly I don’t feel so bad about playing World of WarCraft. At least they’re doing something. As I write this, our pastor is speaking on “Reflections from the Back of a Bike,” noting how we prefer to ride in a car metaphorically driven by the pastor, instead of providing our own power on a bicycle, comparing the early church’s prayer to “speak the Word of God with boldness” as recorded in Acts 4:29 to our typical prayers of, well, whatever; of how we fail to really act on our belief in an Almighty God and actually serve Him with actions, every hour of our lives. How we need to embrace the mission of Christ and actually do something to reflect what we say we believe. To be honest, I have heard many such sermons over the years, but this one is different. It’s Scriptural. It isn’t designed to evoke an emotional response. Its success won’t be measured by the number of people who raise their hands or “go forward” to the altar. Its success will, rather, be measured by how we let Christ give us boldness to use our associations and talents and burdens to change others’ lives. It’s real. It’s a reflection of how he actually lives in following Christ. And the Word of God convicts me, that I ought to be so focused. When I learned that Comcast was finally rolling out it’s long-delayed TiVo service, I was thrilled. I had seen the benefits of TiVo via several friends, but had avoided buying my own TiVo box because the HD versions are so expensive. I had been moderately disappointed in Comcast’s home-grown DVR service (which sported a clunky user interface and a mere 12 hours of nonupgradeable high-definition recording capacity). We counted down the days until the Comcast installer would arrive to upgrade our two cable boxes. To our surprise, rather than merely a firmware update, the installer provided two brand new Motorola DCH3416 boxes, complete with 160 GB of storage and a wonderfully designed TiVo remote. The cable guy came out mid-day on a Friday, and claims he tested everything before he left, but by the time I got home a few hours later, neither TiVo box was working correctly. 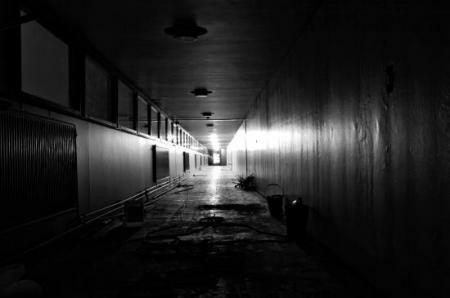 The downstairs box had staccato sound, the upstairs box simply displayed the loading screen and never got beyond it. Tech support had the cable guy call us back, and he was actually willing to drop his kids off and come back out to try to fix the boxes. In talking to customer support and in subsequent visits from the on-site troubleshooters/installers, it became clear that not much information had been propagated to the installers about how to set up these boxes or keep them working. One installer explained that in his training for the new cable box, the cable box was broken, so they had to learn from a PowerPoint presentation on the setup instead. The downstairs new box worked for a few days, and then quit, going into an infinite booting cycle which Comcast guys call the “Crazy Eights,” because for part of the boot-up, the entire display shows all the segments, like in the photo above. Comcast replaced it the box. We learned that updates to the program guide or updates to the firmware can cause this problem, meaning the software hadn’t been quite ready to roll out, from a QA perspective. So far, we are on our ninth cable box. Other than the sound problem exhibited, most of the time the issue was the “Crazy Eights,” although once the downstairs box simply decided it wasn’t going to record anything. Twice the boxes of have recoverable, but at the cost of reinstalling the firmware, which has to be initiated by an on-site tech. (This is apparently an evidence of improvement—until a week ago, such a feat was apparently impossible.) Of course, once you have to exchange the box, all one’s saved programming goes away as well. Likewise, firmware reinstalls seem to wipe out all previously recorded video and settings. The boxes have dual tuners, but the software doesn’t take advantage of them correctly. If one is watching one program, a confirmation dialog requests switching channels to record a scheduled or suggested recording. Hey, it has two tuners. Perhaps the one not in use could be used for the recording? I had a similar problem with two recordings that started an hour apart which I had set to run one minute over; the second recording never happened. There’s no 5.1 digital surround output. We get 48 MHz PCM output that’s in Dolby Surround (stereo) only. This is expected to be fixed in a future software update, but far more critical fixes need to go in first. A software update is due out on April 1, that should correct the “Crazy Eights” and approximately 40 other bugs, but will not yet provide 5.1 digital sound. I hope our current box lasts until then! Addendum: The downstairs box went into “Crazy Eight” mode on Friday. So now we are up to 10 boxes. April 1 came, and of course required a visit from yet another Cable installer. With the update, our box went into a mode where the TiVo software itself wouldn’t work, although we could at least change channels. The technician was actually upset, because he believed he could reset our box with a little bit of help from ATS, but they wouldn’t work with him, so he had to swap it out. He swapped the box, and the downstairs one, and updated them both with the new code. The improvements are significant: The menus respond about twice as fast. The record light illuminates on the box when something is recording. Dolby 5.1 is back (which we did not expect yet). I even think both tuners actually record (we have not tested that yet). So far both boxes are working fine. 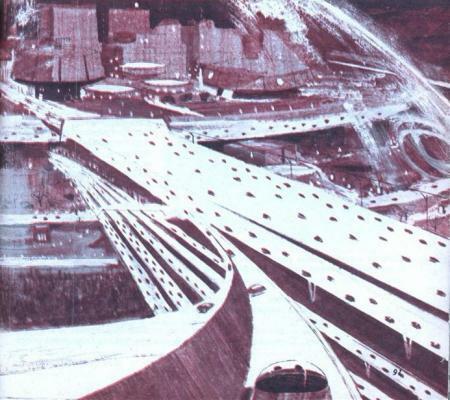 In 2008, Mechanix Illustrated prognosticated on what life would be like 40 years later. Some of the predications are eerily accurate, some may be seen in another 40 years, and as for others, we can only hope. Take a look! Lana Lang (below) was admitted to the Metropolis Psychiatric Hospital (above) earlier today for an indefinite period of intense psychiatric care, after what has been described as an “intense, psychotic break.” Lana is known for having a number of strange, apparently psychiatric episodes. One associate we interviewed believed she had merely “gone Lana” again, citing events such as Lana’s brutally attacking and nearly killing confidante Chloe Sullivan, editor of The Torch, Smallville High School’s often tabloid-like student newspaper, or another period lasting several days when she believed herself to be the incarnation of a 17th-century French witch. Lana Lang, an exceptionally traumatized young lady. Miss Lang is the most severely traumatized case I have seen in my career, far worse than we see even from lengthy, close-quarters combat. Lana seems to have an intense fear of nearly everything, including hospitals. She is recounting stories of being attacked repeatedly at the Talon coffee shop, her parents’ grave site, the Kent farm, Smallville Medical Center, her own residences, Smallville High School, several horse stables, and virtually every outdoor location she has traveled to. She screams or sobs constantly about being hunted, attacked, and buried alive. There is little wonder her sleep is disrupted by incessant nightmares. 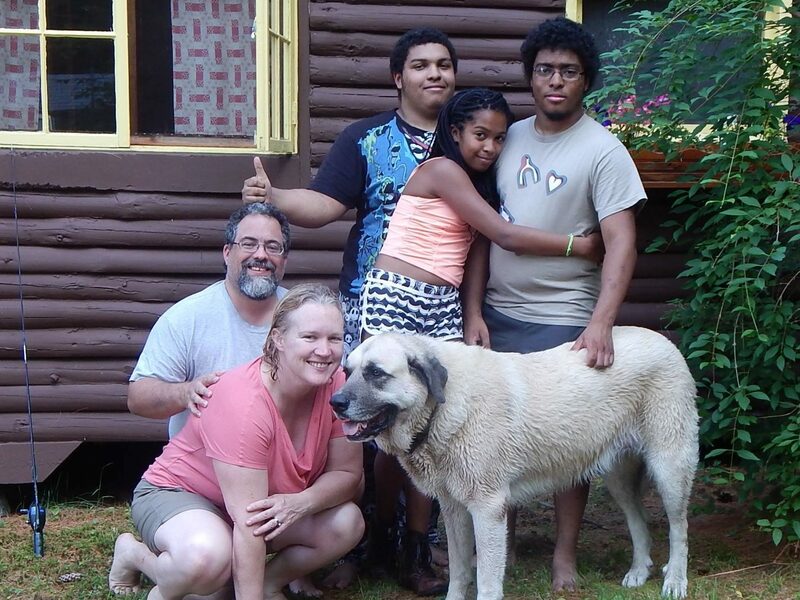 Her medical records, among her numerous admissions for injury or unexplained illness, indicate she even barely survived being caught in a tornado several years ago. She often rocks back and forth in a corner, incessantly mumbling that her friends are keeping secrets from her, and she appears convinced that at any moment anyone around her might suddenly turn on her. If even half the things she describes have actually occurred, it will be a miracle if Miss Lang will ever be able to leave this facility. But we will do our best to help her. Clark Kent, who has been Lana’s friend from early childhood, appeared nervous, and refused to comment on her condition. Here’s an interesting bit on what Lana Lang was like in the comic books. Well, it’s official. 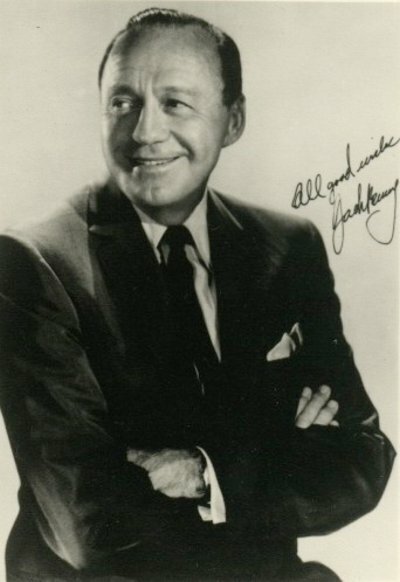 I am now as old as Jack Benny.